Background The framework of a just culture ensures balanced accountability for both individuals and the organization responsible for designing and improving systems in the workplace. Engineering principles and human factors analysis influence the design of these systems so they are safe and reliable. Methods Approaches for improving patient safety introduced here are (1) analysis of error, (2) specific tools to enhance safety, and (3) outcome engineering. Conclusion The just culture is a learning culture that is constantly improving and oriented toward patient safety. People make errors. Errors can cause accidents. In healthcare, errors and accidents result in morbidity and adverse outcomes and sometimes in mortality. One organizational approach has been to seek out errors and identify the responsible individual. Individual punishment follows. This punitive approach does not solve the problem. People function within systems designed by an organization. An individual may be at fault, but frequently the system is also at fault. Punishing people without changing the system only perpetuates the problem rather than solving it. • Two nurses select the (same) wrong vial of intravenous medication from the dispensing system. One nurse administers the drug, causing cardiac arrest. The other nurse realizes the switch when drawing the solution from the vial into the syringe at the bedside. How do we approach the nurses and investigate the situation? • The attending physician tells a resident physician to obtain a specific blood test. The resident forgets. Fearing the wrath of the supervising physician, the resident reports that the result is normal. How do we deal with this breach? • A surgical team does not perform a surgical time out on the grounds that no adverse events have occurred in the past. How do we handle this violation? • The night nurse supervisor reports to a medical director that the lead respiratory therapist was in the hospital at 4:00 am with alcohol on his breath. At a later date, the physician confronts the employee who vehemently denies alcohol abuse. Should the matter be dropped? In the first example, further investigation showed that the 2 vials of entirely different medications looked alike in shape, size, color, and print. This accident waiting to happen did happen to the first nurse and her patient. Human error was involved, but this nurse should be consoled and supported rather than punished. The resident physician falsified patient data, which cannot be condoned and must be addressed. Honest disclosure without fear of retribution is an important characteristic of a just culture. The surgical team cannot function outside of the value-based principles designed by the organization. Although this surgical team has never been involved in an adverse event, one may occur in the future. As for the respiratory therapist, in a just culture we are concerned for the safety of our patients and we are concerned for and care about each other. Further nonpunitive investigation is necessary. Mindfulness throughout an organization considers, but moves beyond, events and occurrences. Everyone in the organization is continually learning, adjusting, and redesigning systems for safety and managing behavioral choices. The Chatsworth train collision occurred on the afternoon of Friday, September 12, 2008 at the beginning of the evening commute in a high-density travel corridor.9 This mass casualty accident brought a massive emergency response by the city and county of Los Angeles, taxing resources to the breaking point. Twenty-five people died, and many survivors were hospitalized for an extended period. The Metrolink train company was exposed to more than $200 million in liability judgments. Investigations revealed that the train engineer did not obey a signal to not enter a single-track segment (designated as such because of oncoming train traffic). The Metrolink passenger train and a freight train were headed toward one other, both moving at a speed of 40 miles per hour. The engineer of the freight train engaged his air brake 2 seconds before impact, while the engineer of the passenger train did not engage his brake. Further investigation revealed that the engineer in the commuter train had a habit of text messaging while operating the train and had been warned about this policy violation. Nevertheless, his cell phone history (delivered under subpoena) showed 2 text messages sent shortly before impact. A spokeswoman for the train company admitted the strong likelihood of operator error and was chastised by the firm as a result. She resigned. The Chernobyl accident in the Ukraine is the only accident in the history of nuclear power that resulted in fatalities from radiation.11 An explosion and fires released the contents of the reactor core into the atmosphere, and radioactive material moved downwind. The 2 plant operators died immediately; another 28 people died of acute radiation poisoning. The disaster provides insight into the serious consequences of ignoring safety issues. Investigation after the event revealed a flawed reactor design compounded by inadequately trained personnel operating the facility. Twenty years later, the only resulting public health issue is an increased incidence of thyroid cancer. These anecdotes and exhaustive investigational material from other industries indicate several points that apply to the healthcare environment. 2. Written checklists help prevent crises. 3. Established written procedures are vital in crises. 4. Training in decisionmaking and crew resource management are valuable. 5. Systematic drills and practice using simulation technology address the ability to handle crisis situations. In a landmark publication, Reason presented a detailed analysis of human error.12 Reason introduced his text by referring to the 1928 studies of Spearman but asserted that the decade prior to the publication of his book was characterized by public concern about the terrible cost of human error. He lists the Tenerife runway collision in 1977, the Three Mile Island crisis in 1979, the Bhopal methyl isocyanate disaster in 1984, the Challenger and Chernobyl explosions of 1986, the capsize of the Herald of Free Enterprise, the King's Cross tube station fire in 1987, and the Piper Alpha oil platform explosion in 1988 as causes for a collective impetus to address error. Furthermore, this decade made clear that the nature and scale of such tragedies impacted wide geographic areas and generations of humans. … whose adverse consequences may lie dormant within the system for a long time, only becoming evident when they combine with other factors to breach the system's defences … Latent errors … are most likely to be spawned by those whose activities are removed in both time and space from the direct control interface: designers, high-level decision makers, construction workers, managers and maintenance personnel. Latent errors exist in complex systems. Reason uses a medical metaphor, describing them as resident pathogens, much like microorganisms, that can exist in an organism only to emerge and proliferate when defenses are inadequate. 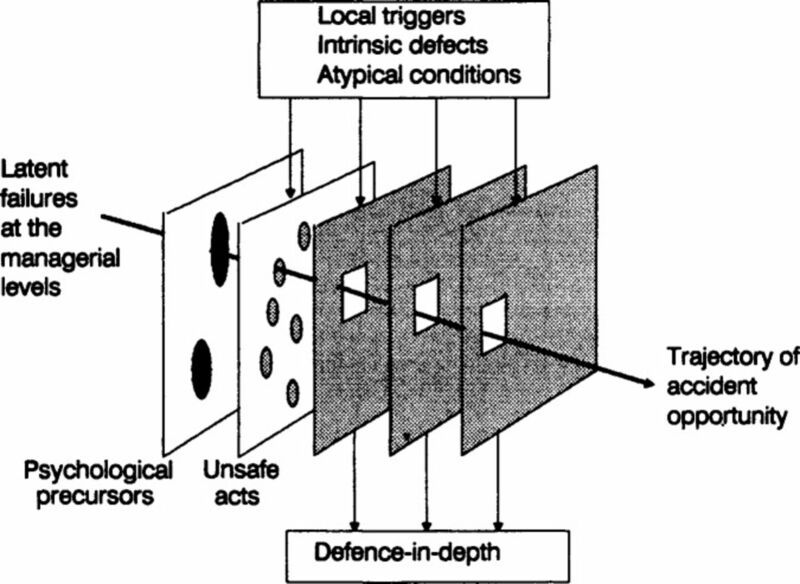 Reason's model of accident causation begins with latent failures, and the Swiss cheese plates represent psychological precursors and unsafe acts, local triggers, and failures of other defenses. The trajectory of error opportunity results from the alignment of the holes in the slices of Swiss cheese. Gaba and colleagues13 adapted this model to the practice of anesthesiology. Some of the latent failures in this specialty include machine and process design flaws, manufacturing defects, maintenance failure, underlying disease, production pressure, fatigue, and environmental factors. With a triggering event and the failure of preventive measures (preoperative evaluation, checklists, etc), an event occurs. The clinician must respond with dynamic decisionmaking to detect and correct the critical incident before it results in an adverse outcome. Safety—fostered by teamwork, leadership, and communication—has been a major focus of military efforts. Historical events illustrate this focus. Admiral Lord Nelson was renowned as a leader, military strategist, and communicator. His communication skills extended beyond interpersonal relationships. Communicating from his command ship through a flag system, he was able to instruct his entire fleet to come about as one to achieve unorthodox strategies. With fewer and smaller ships, but through precision ship positioning and gunnery training, he defeated the Spanish Armada (once thought invincible) and the allied French navy.14 Lord Nelson understood leadership and communication in a way that applies to medicine. His communication to his sailors was safe, timely, effective, and always oriented to the task at hand. CAPTAIN: Come right to 190, all ahead one-third. BOSUN: Aye sir, right to 190, all ahead one-third. The call out, check back, and other scripting techniques ensured that orders were received, confirmed, understood, and executed. Military aviation develops effective team leaders on the ground, at sea, and in the air. Whether on land or at sea, pilots assemble in a ready room to review the mission, understand objectives, and unify the team. Events are described, recorded, visually confirmed, and processed. After flying the mission, a second assembly of the pilots focuses on a thorough debriefing. What went well? What went wrong? Were objectives accomplished? What areas can be improved? What is the next step? Safety. Above all, Safety. We learn safe practices and procedures. We follow them on board and ashore. We watch our shipmates to ensure they do too. We immediately speak up when we think we see an unsafe practice developing. We listen. We care about the safety of our shipmates and ourselves. If any situation tests our commitment to safety, safety comes first. These same leadership and communication skills can be successfully applied to healthcare. The U.S. Congress commissioned the Department of Defense and the Agency for Healthcare Research and Quality (AHRQ) to translate the principles of a just culture into a format applicable to the delivery of healthcare.16 The result of this collaboration was the TeamSTEPPS (Strategies and Tools to Enhance Performance and Patient Safety) approach to patient safety. Consistent with the principles demonstrated in the above military examples, TeamSTEPPS focuses on leadership and communication skills (with scripting), mutual support of team members, and situation monitoring. It identifies barriers, suggests observation tools, and focuses on outcomes. TeamSTEPPS also helps participants assess whether the safety culture is being sustained. Functional issues must be addressed in a just culture.18,19 While encouraging personnel to report mistakes, identify the potential for error, and even stop work in acute situations, a just culture cannot be a blame-free enterprise. Competency is one issue, but even competent professionals make mistakes. In complex, dynamic, and inherently risky environments, society has an expectation for human performance. After identifying an adverse event or near miss, the investigation procedure technique becomes paramount (Figure 2). Two approaches have been successfully implemented in hospitals. Reason12 highlights the notion of intent when considering the nature of error. Slips (eg, Freudian slips) lack intention; that is, the actions are not carried out as intended or planned. Lapses are missed actions or omissions, with the perpetrator often conscious of the action and believing that it will not lead to harm. Mistakes involve error, ie, faulty planning or intention; the individual involved believes the action to be correct. Corrective action and coaching, not punishment, are indicated for improving the system. At-risk behavior includes both intention and the violation of rules, policies, and procedures and makes a system vulnerable, increasing risk. The individual should be coached to understand the risks resulting from his or her action. Reckless behavior may be grounds for disciplinary action, and civil or criminal charges may be filed against the individual. Punishment, including termination, may be the appropriate consequence. • The deliberate harm test: a conscious and deliberate breach of duty resulting in patient harm. The goal of the institution or system is to establish or refute this violation immediately as a first step. • The physical/mental health test: a provider is impaired for any reason, including substance abuse. The impact of impairment or the patient outcome must be established. • The foresight test: once the deliberate intent to harm and physical/mental health tests have been discounted, this analysis establishes whether protocols, policies, and procedures have been followed. Because both algorithms have merits, Leonard and Frankel19 schematically integrated them into a single format that involves a 3-step process. 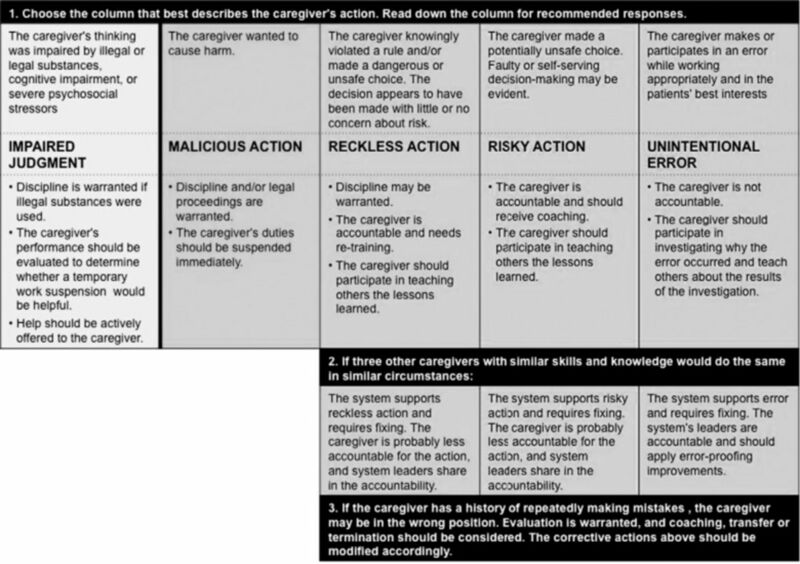 The first step analyzes the individual caregiver's actions via 5 measures: impaired judgment, malicious action, reckless action, risky action, and unintentional error. The second step determines if other caregivers with similar skills and knowledge would react the same way in similar circumstances. The final step is the important determination of whether the present system supports reckless or risky behavior and thus requires redesign. In a just culture, both the organization and its people are held accountable while focusing on risk, systems design, human behavior, and patient safety. This article meets the Accreditation Council for Graduate Medical Education and the American Board of Medical Specialties Maintenance of Certification competencies for Patient Care and Professionalism. The author has no financial or proprietary interest in the subject matter of this article. (2008) Just Culture: Balancing Safety and Accountability (Ashgate Publishing; Burlington, VT). (2001) Patient Safety and the Just Culture: A Primer for Health Care Executives (Trustees of Columbia University; New York, NY). (12, 2009) Column: the growth of a just culture. Jt Comm Perspect Patient Saf 9(12):8–9. (2001) Managing the Unexpected: Assuring High Performance in an Age of Complexity (Jossey Bass; San Francisco, CA). (6, 2009) Errors in medicine. Clin Chim Acta 404(1):2–5, pmid:19302989, Epub 2009 Mar 18. (2000) Structural and organizational issues in patient safety: a comparison of health care to other high hazard industries. Calif Manage Rev 43(1):83–102, Fall:. (3 18, 2000) On error management: lessons from aviation. BMJ 320(7237):781–785, pmid:10720367. (1988) in Tasks, Errors, Mental Models: A Festchrifts to Celebrate the 60th Birthday of Professor Jens Rasmussen, Coping with complexity: the psychology of human behavior in complex systems, eds Goodstein LP, Olsen SE, Anderson HB (Taylor and Francis; London, England) In, eds, pp 128–148. (2010) (2012) Collision of Metrolink Train 111 with Union Pacific Train LOF65–12. Railroad Accident Report NTSB/RAR-10/01, Chatsworth, California, September 12, 2008. http://www.ntsb.gov/doclib/reports/2010/RAR1001.pdf. Accessed November 30,. (2010) (2012) Loss of Thrust in Both Engines After Encountering a Flock of Birds and Subsequent Ditching on the Hudson River, US Airways Flight 1549, Airbus A320-214, N106US, Weehawken, New Jersey, January 15, 2009. Aircraft Accident Report NTSB/AAR-10/03, http://www.ntsb.gov/doclib/reports/2010/aar1003.pdf. Accessed November 30,. (2012) (2013) Chernobyl Accident 1986. http://www.world-nuclear.org/info/Safety-and-Security/Safety-of-Plants/Chernobyl-Accident. Accessed June 4,. (1990) Human Error (Cambridge University Press; New York, NY). (1994) Crisis Management in Anesthesiology (Churchill Livingstone; New York, NY). (1990) The Price of Admiralty: The Evolution of Naval Warfare (Penguin Books; Philadelphia, PA). (2012) Integrating Quality: Linking Clinical and Educational Excellence. https://www.aamc.org/download/129632/data/boysen.pdf.pdf. Accessed November 30,. (9, 2010) Changing the culture in medical education to teach patient safety. Health Aff (Millwood) 29(9):1600–1604, pmid:20820014. (2013) TeamSTEPPS: National Implementation. http://teamstepps.ahrq.gov/about-2cl_3.htm. Accessed June 28,. (8, 2006) Fair and just culture, team behavior, and leadership engagement: The tools to achieve high reliability. Health Serv Res 41((4 Pt 2)):1690–1709, pmid:16898986. (9, 2010) The path to safe and reliable healthcare. Patient Educ Couns 80(3):288–292, pmid:20688455, Epub 2010 Aug 4. (2011) Patient Safety: A Human Factor Approach (CRC Press; Boca Raton, FL). (2013) Seven Steps to Patient Safety in General Practice. http://www.npsa.nhs.uk/EasySiteWeb/GatewayLink.aspx?alId=43743. Accessed June 28,. (2013) Personal Accountability in Healthcare: Searching for the Right Balance. The Health Foundation, May 2012. http://www.health.org.uk/public/cms/75/76/313/3426/Personal%20accountability%20in%20healthcare%20searching%20for%20the%20right%20balance%20thought%20paper.pdf?realName=Al5J91.pdf. Accessed June 28,. (2013) Leadership Committed to Safety. http://www.jointcommission.org/assets/1/18/SEA_43.PDF. Accessed June 28,. (10, 2002) The morbidity and mortality conference: the delicate nature of learning from error. Acad Med 77(10):1001–1006, pmid:12377674.